The LED High Bay range has been designed to replace a wide variety of conventional commercial and industrial luminaires. Constructed of high purity Aluminium casing and a spun polished reflector manufactured to an IP65 rating, allowing the luminaire to be used in both harsh internal and external environments. The High Power Bridgelux LED light engine and cutting edge driver technology give an expected lifetime of 50,000 hours ensuring the luminaire is virtually maintenance free. 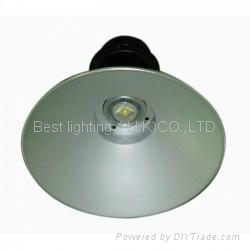 The luminaire’s design makes it ideal for use in warehousing, cold storage areas, tunnels and general lighting areas. The High Bay range can be easily used in conjunction with lighting controls to further reduce energy consumption. Dimmable options are available, these can be incorporated into stand alone dimmable systems or automated daylight control systems. Also available with various beam angle options allowing excellent versatility for any required application. High Bay lights available in 50w, 100w, 150w and 200w.